A great way for a small business to reach out to passing customers is to use a sidewalk sandwich sign. For $199 you get a double sided sandwich sign like the one pictured. We print a 24×36″ sintra graphic in full color. It slips into each side of the sandwich sign so that people see it whichever way they are going. The signs are easily changed when you want to update the graphics. The sign holder itself is a blow-molded rugged plastic that will last for years. There’s a handy holder at the top that allows you to pick it up and bring it back into your shop at the end of the day. It folds flat for easy storage. We can help with the graphic design too, if you need that. Or, you can send us files ready to print and have your sandwich sign back in a few days. 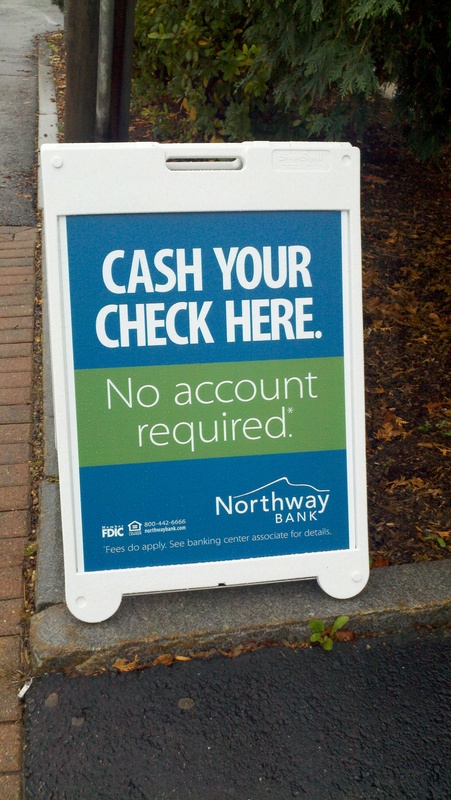 This entry was posted in large format printing and tagged sandwich sign, sidewalk sign, store signs. Bookmark the permalink.